Only showing posts tagged with "LINQ"
tag => tag.ID == 10 || tag.ID == 12 || tag.Name == "C#" || tag.Name == "Expression Trees"
Now that we want to query multiple properties, we’ll need to change this signature to something that allows you to pass multiple wantedItems lists and a memberAccessExpression for each of them. Eeek! That’s a pretty massive new single parameter. What we’re now doing is passing in multiple Tuples (if you’re using .NET 3.5, make your own Tuple class), where the first component is the list of wanted items, and the second component is the member access expression. You’ll notice that a lot of the generic types have gone out the window and we’re passing IEnumerables of object and LambdaExpressions around; this is a price we’ll have to pay for having a more flexible method. Note having to explicitly specify “object” for the array of IDs; this is because, although you can now assign IEnumerable<ChildClass> to IEnumerable<ParentClass> (covariance) in C# 4, that only works for reference types. Value types are invariant, so you need to explicitly force int to be boxed as a reference type. 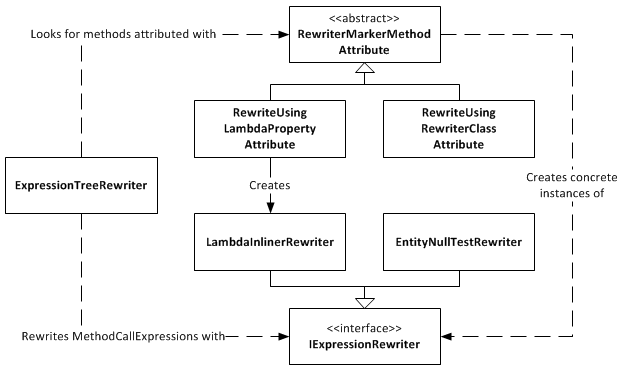 Note also having to explicitly cast the member access lambda expressions; this is because the C# compiler won’t generate an expression tree for you unless it knows you explicitly want an Expression<T>; casting forces it to understand that you want an expression tree here and not just some anonymous delegate. As I explain this method, you may want to keep an eye on the expression tree diagram from the previous post, so you can visualise the expression tree structure easily. The method loops through each tuple that contains a wantedItems collection and a memberAccessExpression, and progressively builds an expression tree from all the items in all the collections. You’ll notice within the foreach loop that the ParameterExpression from the first memberAccessExpression is kept and used to “rewrite” subsequent memberAccessExpressions. 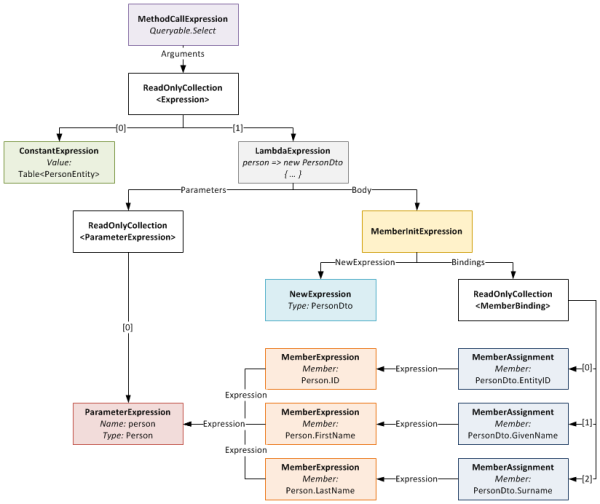 Each memberAccessExpr is a separate expression tree, each with its own ParameterExpression, but since we’re now using multiple of them and combining them all into a single expression tree that still takes a single parameter, we need to ensure that those expressions use a common ParameterExpression. We do this by implementing an ExpressionVisitor that rewrites the expression and replaces the ParameterExpression it uses with the one we want it to use. In conclusion, we see that wanting to query those additional properties required us to add a whole bunch more code in order to make it work. However, in the end, it does work and works quite well, although admittedly the method is a little awkward to use. This could be cleaned up by wrapping it in a “builder”-style class that simplifies the API a little, but I’ll leave that as an exercise to the reader. After a hell of a lot of work, I am happy to announce that the 1.0.0 version of DigitallyCreated Utilities has been released! DigitallyCreated Utilities is a collection of many neat reusable utilities for lots of different .NET technologies that I’ve developed over time and personally use on this website, as well as on others I have a hand in developing. It’s a fully open source project, licenced under the Ms-PL licence, which means you can pretty much use it wherever you want and do whatever you want to it. No viral licences here. And truly, nothing is more frustrating than code with bad documentation. To me, bad documentation is the lack of a unifying tutorial that shows the functionality in action, and the lack of decent XML documentation on the code. Sorry, XMLdoc that’s autogenerated by tools like GhostDoc, and never added to by the author, just doesn’t cut it. If you can auto-generate the documentation from the method and parameter names, it’s obviously not providing any extra value above and beyond what was already there without it! DCU is split across six different assemblies so that developers can pick and choose the stuff they want and not take unnecessary dependencies if they don’t have to. This means if you don’t use Unity in your application, you don’t need to take a dependency on Unity just to use the Error Reporting functionality. I’m really pleased about this release as it’s the culmination of rather a lot of work on my part that I think will help other developers write their applications more easily. I’m already using it here on DigitallyCreated in many many places; for example the Error Reporting code tells me when this site crashes (and has been invaluable so far), the CompiledQueryReplicator helps me use compiled queries effectively on the back-end, and the ReaderWriterLock is used behind the scenes for the Twitter feed on the front page. I hope you enjoy this release and find some use for it in your work or play activities. You can download it here. I was working on some ASP.NET MVC code today and I created this neat little solution that uses a custom model binder to automatically read in a bunch of dynamically created form fields and project their data into a set of business entities which were returned by the model binder as a parameter to an action method. The model binder isn't particularly complex, but the way I used regular expressions and LINQ to identify and collate the fields I needed to create the list of entities from was really neat and cool. I chose to use the weird ":n" format instead of a more obvious "[n]" format (like arrays) since using "[" is not valid in an ID attribute and you end up with a page that doesn't validate. Both regexs work like this: the ^ at the beginning and the $ at the end means that, in the matching string, there cannot be any characters before or after the characters specified in between those symbols. It effectively anchors the match to the beginning and the end of the string. Inside those symbols, each regex matches their field name and the ":" character. They then define a special "group" using the ()s. Using the group allows me to pull out the sub-part of the regex match defined by this group later on. The \d+ means match one or more digits (0-9), which matches the number after the ":". Note that I've made the Regex objects static readonly members of my binder class. Keeping a single instance of the regex object, which is immutable, saves .NET from having to recompile a new Regex every time I bind, which I believe is a relatively expensive process. I then use LINQ to perform matches against all the fields in the current page submit (via the BindingContext's ValueProvider IDictionary). I do this using a Select() call, which performs the match and puts the results into an anonymous class. I then filter out any fields that didn't match the regex using a Where() call. Now I need to link up VolumeUpperBound fields with their associated Cost fields. To do this, I do an inner equijoin using LINQ. I join on the result of that regex group that I created that extracts the number from the field name. This means I join VolumeUpperBound:0 with Cost:0, and VolumeUpperBound:1 with Cost:1 and so on. I then use a where clause to ensure the values submitted are actually of the correct type, since the Value member is actually a string at this point (I pass them into a ValuesAreValid method, which returns a bool). This method marks the ModelState with an error if it finds a problem. I then use Select to create a CostRangeItem per join and copy in the values from the form fields using an object initialiser. I can then finally return my List of CostRangeItem. The ASP.NET MVC framework ensures that this result is passed to the action method that declared that it wanted to use this model binder. As you can see, the solution ended up being a neat declarative way of writing a model binder that can pull in and bind multiple objects from a dynamically created form. I didn't have to do any heavy lifting at all; regular expressions and LINQ handled all the munging of the data for me! Super cool stuff. Most of the queries you do in your application are probably static queries. The parameters you set on the query probably change, but the actual query itself doesn't. That's why compiled queries are so cool, because you can pre-compile and reuse a query over and over again and just vary the parameters (see my last blog for more information). But sometimes you might need to construct a query at runtime. By this I mean not just changing the parameter values, but actually changing the query structure. A good example of this would be a filter, where, depending on what the user wants, you dynamically create a query that culls a set down to what the user is looking for. If you've only got a couple of filter options, you can probably get away with writing multiple compiled queries to cover the permutations, but it only takes a few filter options before you've got a lot of permutations and it becomes unmanageable. A good example of this is file searching. You can filter a list of files by name, type, size, date modified, etc. The user may only want to filter by one of these filters, for example with "Awesome" as the filename. But the user may also want to filter by multiple filters, for example, "Awesome" as the filename, but modified after 2009/07/07 and more than 20MB in size. To create a static query for each permutation would result in 16 queries (4 squared)! My first foray into creating dynamic queries is a bit less ambitious than the above example, however. I have a scenario where I need to pull out a number of Tag objects from the database by their IDs. However, the number of the Tag objects needed is determined by the user. They may select 3 Tags, or they may select 6 Tags, or they may select 4 tags; it's up to them. You could compile that query to make it run faster, but it's still a slow operation. If the user wants to get 6 Tags, you need to query the database 6 times. Not very cool. This is where dynamic queries can step in. If the user asks for 3 Tags, you can generate a where clause that gets all three Tags in one go; essentially: tag.ID == 10 || tag.ID == 12 || tag.ID == 14. That way you get all three Tags in one query to the database. So, I wrote some generic type-safe code to perform exactly that: generating a where clause expression from a list of IDs so that a Tag with any of those IDs is retrieved. The Where method takes a parameter that looks like this: Expression<Func<Tag, bool>>. Notice how the Func delegate is wrapped in an Expression? This means that instead of creating an actual anonymous method for the Func delegate, the compiler will instead convert your lambda expression into an Expression Tree. The LambdaExpression has a collection of ParameterExpressions, which are the parameters on the left side of the => symbol in the code. The actual Body of the lambda is made up of a BinaryExpression of type Equals, whose Right side is a ConstantExpression that contains the value of 10, and whose Left side is a MemberExpression. A MemberExpression represents the access of the ID property on the tag parameter. this is what the expression tree would look like. It looks a bit daunting, but computers are very good at trees, so writing code to generate such a tree is not too difficult with the help of a little recursion. As I explain how it works, I suggest you keep an eye on the last expression tree diagram. The method defines two generic types, one called TValue which represents the value you are comparing, in this case the Tag class. The other generic type is called TCompareAgainst and is the type of the value you are comparing against, in this case int (because the Tag.ID property is an int). You pass the method an IEnumerable<TCompareAgainst>, which in our case is an IEnumerable<int>, because we have a list of IDs we are comparing against. The second parameter ("convertBetweenTypes") can be a bit confusing; let me explain. The expression we are defining for the Where clause takes a Tag and returns a bool (hence the Func<Tag, bool> typed expression). Since the set of values we are comparing against are ints, we can't just do an == between the Tag and an int. To be able to do this comparison, we need to somehow "convert" the Tag we receive into an int for comparison. This is where the second parameter comes in. It defines an Expression that takes a Tag and returns an int (or in generic terms takes a TValue and returns a TCompareAgainst). When you write tag => tag.ID, the compiler generates an Expression Tree that contains a MemberExpression that accesses ID on the tag ParameterExpression. This means wherever we need to do a Tag == int, we instead do a Tag.ID == int by substituting the Tag.ID MemberExpression generated in the place of the Tag. Here's a diagram that explains what I'm ranting about. The main purpose of this method is to create the final LambdaExpression that the method returns. It does this by attaching the expression tree built by the BuildBinaryOrTree method (we'll get into this in a second) and the ParameterExpression from the convertBetweenTypes to the final LambdaExpression object. It takes an IEnumerator that enumerates over the wantedItems list (from the BuildOrExpressionTree method), an expression to compare each of these wanted items to (which is the compiler-generated MemberExpression from BuildOrExpressionTreeMethod), and an expression from a previous recursion (starts off as null). The method creates an Equals BinaryExpression that compares the expressionToCompareTo and the current itemEnumerator value. It then joins this in an OrElse BinaryExpression comparison with the expression from previous recursions. It then takes this new expression and passes it down to the next recursive call. This process continues until itemEnumerator is exhausted at which point the final expression tree is returned. Once this returned expression tree is placed in its LambdaExpression by the BuildOrExpressionTree method, you end up with a pretty expression tree like this one shown previously. 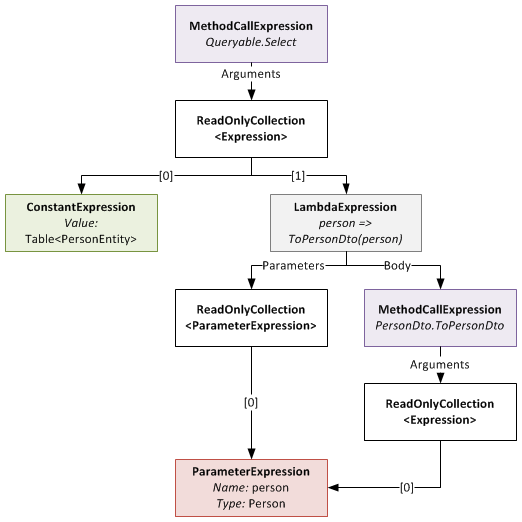 We can then use this expression tree in the where clause of a LINQ method chain query. So how much better is this approach, which is decidedly more complex than the simple "get each Tag at a time" approach? Is it worth the effort? I performed some benchmarks similar to the ones I did in the last blog to find out. The "generated where clause" query. The where clause was regenerated each time. As you can see, the Generated Where Clause approach is quite a lot faster than the individual queries. We can see compiling the Individual query helps, but not enough to beat the Generated Where Clause query, which is faster even though it is recompiled each time! (You can't precompile a dynamic query, obviously). The Generated Where Clause query is 6.8 times faster than the compiled Individual query and a whopping 16.2 times faster than the uncompiled Individual query. Even though dynamic queries are lots harder than normal static queries, because you have to manually mess with Expression Trees, there are large payoffs to be had in doing so. When used in the appropriate place, dynamic queries are faster than static queries. They could also potentially make your code cleaner, especially in the case of the filter example I talked about at the beginning of this blog. So consider getting up to speed with Expression Trees. It's worth the effort. Entity Framework is the new (as of .NET 3.5 SP1) ORM technology for the .NET Framework. ORM technologies are widely accepted as the "better" way of accessing relational databases, because they allow you to work with relational data as objects in the world of objects. However, ORM tech can be slower than writing manual SQL queries yourself. This can be seen in this blog that benchmarks Entity Framework versus LINQ to SQL and a manual SQLDataReader. Hardware is cheap (compared to programmer labour, which is not) so getting a faster machine could be an effective strategy to counter performance issues with ORM. However, what if we could squeeze some extra performance out of Entity Framework with only a little effort? This is where Compiled Queries come in. Compiled queries are good to use where you have one particular query that you use over and over again in the same application. A normal query (using LINQ) is passed to Entity Framework as an expression tree. Entity Framework translates it into a command tree that is then translated by a database-specific provider into a query against a database. It does this every time you execute the query. Obviously, if this query is in a loop (or is called often) this is suboptimal because the query is recompiled every time, even though all that's probably changed is the parameters in the query. Compiled queries ensure that the query is only compiled once, and the only thing that varies is the parameters. I created a quick benchmark app to find out just how much faster compiled queries are against normal queries. I'll illustrate how the benchmark works and then present the results. Basically, I had a particular non-compiled LINQ to Entities query which I ran 100 times in a loop and timed how long it took. I then created the same query, but as a compiled query instead. I ran it once, because the query is compiled the first time you run it, not when you construct it. I then ran it 100 times in a loop and timed how long it took. Also, before doing any of the above, I ran the non-compiled query once, because it seemed to take a long time for the very first operation using the Entity Framework to run, so I wanted that time excluded from my results. As you can see, it's nothing fancy, just a simple query with a small where clause. This query returns 39 Transaction objects from my database (SQL Server 2005). As you can see, to create a compiled query you pass your LINQ query to CompiledQuery.Compile() via a lambda expression that defines the things that the query needs (ie the Object Context (in this case, DHEntities) and the parameters used (in this case two DateTimes). The Compile function will return a Func delegate that has the types you defined in your lambda, plus one extra: the return type of the query (in this case IQueryable<Transaction>). The results are impressive. In this case, compiled queries are 8.5 times faster than normal queries! I've showed the standard deviation so that you can see that the results didn't fluctuate much between each benchmark run. The use case I have for using compiled queries is doing database access in a WCF service. I expose a service that will likely be beaten to death by constant queries from an ASP.NET MVC webserver. Sure, I could get larger hardware to make the WCF service go faster, or I could simply get a rather massive performance boost just by using compiled queries. I've been having to use RealDWG for my part time programming work at Onset to programmatically read DWG files (AutoCAD drawing files). I've been finding RealDWG a pain to learn, as AutoDesk's documentation seems to assume you're an in-house AutoCAD programmer, so they blast you with all these low level file access details like BlockTables and SymbolTables. However, this isn't surprising, since I believe AutoDesk eat their own dog food and use the same API internally. That doesn't make it any easier to learn and use, though. RealDWG (or ObjectARX, which is the underlying API that is wrapped with .NET wrapper classes) reads a DWG file into an internal "database". Everything is basically an ObjectId, which is a short stub object that you give to a Transaction object that will get you the actual real object. Objects are nested inside objects, which are nested inside more objects, and none of it typesafe, as Transaction returns objects as their top level DBObject class. So you're constantly casting to the actual concrete type you want. Casting all over the place == bad. The method is generic and takes an IEnumerable (which is the non-generic interface that all the RealDWG stuff that you can iterate over implements) and a Transaction (to open objects from ObjectId stubs with). Additionally, it takes a Predicate<T> that allows you to specify a condition on which concrete objects are included in the final set. It returns an IEnumerable of the generic type T.
What the method will do is iterate over the IEnumerable and pull out all the objects that match the generic type that you define when you call the method. Additionally, it will return only those objects that match your predicate. The method uses the yield return keywords to lazy return results as the returned IEnumerable is iterated over. Just like using LINQ, the above snippet (which looks longer than it really is thanks to wrapping) simply declares that it wants all BlockTableRecords in the BlockTable that have attribute definitions (using a lambda expression). It's much neater, if only because it shifts the filtering code out of the way into the Filter method, so that it doesn't clutter up what I'm trying to do. It also makes the foreach type-safe, because now we're iterating over an IEnumerable<T> rather than a non-generic IEnumerable. Worst case: the IEnumerable<T> is empty. No InvalidCastExceptions here. Optimally you use the overload that doesn't include the Predicate<T> as a parameter, instead of passing null as the predicate (the overload passes null for you). I didn't show that here, but it's in my code. Wrapping up, this again confirms how much I love C# 3.0 (and soon 4.0!). All the new language features let you do some simply awesome things that you just can't do in aging languages like Java (Java doesn't even have delegates, let alone lambda expressions! ).